I cannot recall when my enjoyment of the hills changed from a haphazard series of adventures to the systematic pursuit of a list. In my youth I walked hills with little preparation and often didn't know the names of subject mountains. What a waste! Now I think long and hard about how to squeeze the maximum number of Arderins into a single day. I record everything. The notion that I would expend time on a 499 metre midget, unless it was actually "in the way", is anathema to me. But if it were 500 metres or 501, why then it is a beauty to be pursued with vigour. So here I am, a child of Erin, enslaved to a creature of the Napoleonic Code with no roots in feet or yards. And in this servile addiction the notion that I would travel the same way twice, well that is just beyond contemplation. When the recent Reeks Scavvy was announced I winced. The best walking in the country is a sterile prospect for a man who has been there before, and has yet to finish his List. A man with a mission. And yet I longed for the fellowship of my MV compatriots. The shared anticipation, the earnest launch, the emergence of slagging, fun poking and the like. The communal bliss of achievement in perfect weather. The mishaps. The disasters. The tired bonhomie of the waning day. The eating and drinking and making merry. The emerging mythology of the endeavour. All that I forsook to trudge the road untravelled in pursuit of my compulsion to add another few strings to my Stradivarious. So l arose at 3 am on Saturday (one hour earlier than expected due to an error setting my alarm at 1.30 am!). 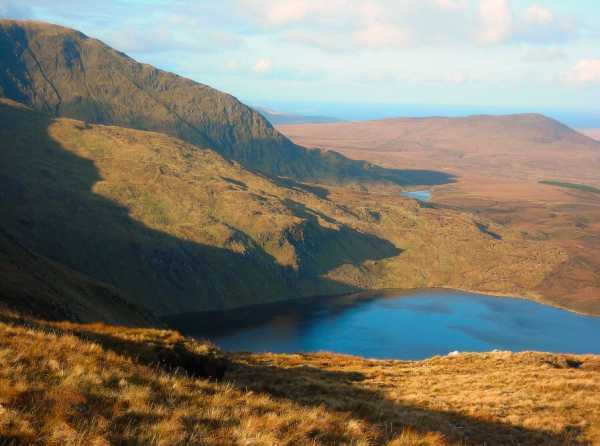 Arose and drove to Galway with a child's bike in the boot and a determination to walk all six of the Sheffrey Arderins. I drove to Maam Cross and took a right turn to Leenane on what I have always believed is the strange green side of the Maamturks. Even in the pitch dark there was something huge and black about the Turks, the way they blocked out starlight from the west. Through Leenane. Around the fjord. Past Delphi and into the Doolough valley. I took a left after Ben Creggan and went as far as Sheefrey Bridge to drop my haversack and poles. Then straight back to Doolough, parked, took out the bike, and cycled back the miles to the bridge, collected my gear, hid the bike, and started up the Western Way towards Tawny Rower, first of the Big Six. What a "statement" is dawn! What peace. What solitude. As I trudged I thought of the others on the way to An Chruach Mhor and felt the bittersweet pang of the gloriously lonely.